Just Shutters, the interior shutter specialists, are very pleased to offer the widest range and unbeatable value to homes and businesses. Plantation Shutters Knutsford, Northwich, Mobberly and the surrounding areas. Having gained an incredible reputation for quality and service, Just Shutters have grown to become a leading UK company, specialising purely in the design and installation of the finest interior shutters. Each set of shutters is bespoke, designed specifically for each window or door, which means that every set will be unique to the room, personal to you! So whether you desire a daring, decadent statement that will wow your visitors, or an overall subtle, tasteful addition to your current theme, we have the answer that will match your taste and lifestyle perfectly. Arched, angled, large, or hard to reach windows – not a problem for shutters! Not only do they look great at regular shaped windows, shutters also offer a functional, enhancing solution to difficult spaces. Click here to browse our range of shutters (the largest in the UK! ), then click here to view our galleries for more inspiration! 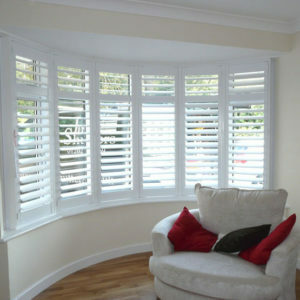 Why choose Just Shutters in Knutsford? Please call us on 0161 413 4525 to discuss your needs and to arrange an appointment with your local expert. Overall design and fitting of shutters. One set of triple fold plantation shutters and one set of bi-fold plantation shutters. Shutters fitted to bedroom and to lounge.